“Don’t let anyone know how easy this is,” North Sails president Ken Read said. “Sure, no problem,” I said, far more concerned with how long he’d let me keep steering. At the moment I was at the helm of Jim and Kristy Hinze-Clark’s 100ft super-Maxi Comanche, steering the boat on a close reach in around 18 knots of breeze, and the boat was going around 22 knots. Yes, 22 knots. And, yes, it really was that easy. 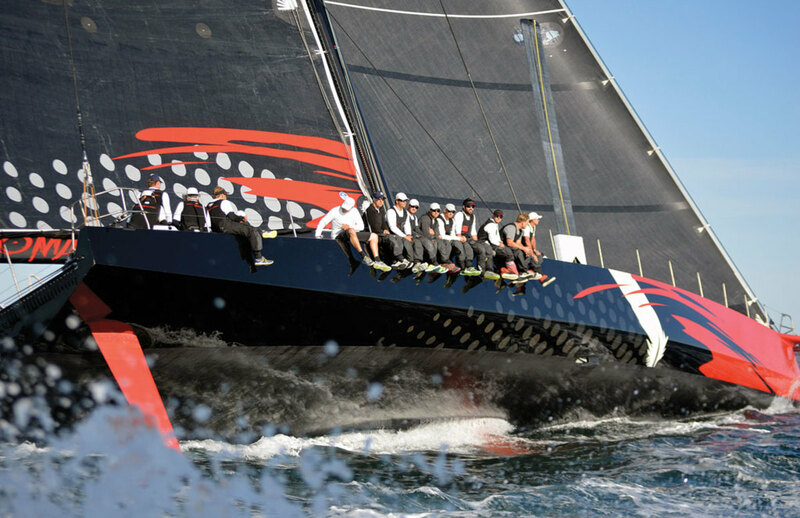 I’d been invited aboard to see what it was like as Read and the rest of the crew prepared for last June’s Newport-Bermuda Race (the same race in which they would smash the line honors record by completing the 635-mile course in an incredible 34 hours, 42 minutes). The boat also holds the current 24-hour distance record, having covered 620 miles in 24-hours during last year’s Transatlantic Race, and at press time was on standby for a crack at the Transatlantic record. Going 20-plus knots on a 100ft sailboat is a bit like travelling at close to the speed of light in that the very laws of physics seem to go out of whack. For example, the distance between where you’re sitting on the rail and the water rushing below feels unnaturally great, like you’re flying as opposed to sailing. Similarly, the wake rushing out arrow-straight astern doesn’t gurgle, it doesn’t even hiss. It sizzles. The spray coming over the bow doesn’t just splash across the foredeck, it gets sucked into the slot and is instantly atomized as if it was being sucked into a jet engine. It can all be a bit overwhelming until you get used to it. And then the next thing you know, sailing at 22, 23 … 27 knots—which we did when the crew unrolled the boat’s massive A-sail—seems like the most natural thing in the world until something goes wrong. In our case, what went wrong was pretty minor. The tack fitting on the spinnaker let go: no big deal. That’s why the crew was out there, to de-bug the boat after its recent refit. At one point, though, as the crew was sheeting in—with six big guys spinning the handles on the coffee grinders for all they were worth—the line fell slack for a moment or two before the sail suddenly filled again as it came out from behind the main. As it did so, the tack line came bar tight in the blink of an eye, in the process slapping against the carbon-fiber deck with a crack that sounded like a gunshot: a bang so violent in its latent power all heads involuntarily turned. Again, no big deal. However, it did serve as a vivid reminder of the immense forces at work all around me. It also got me thinking about what it must be like aboard such a powerful boat when things go wrong for real—as they inevitably will aboard any sailboat—that and what it must be like handling a boat like Comanche on a moonless night changing sails in a squall. Read may be right about helming a boat like Comanche at 22 knots on a sunny day in flat seas off Newport with a profoundly experienced crew at the ready. But don’t be fooled. Truly sailing a boat like Comanche is neither for the faint of heart nor for anyone without the very finest sailing skills.